Leopoldina Roubian feels like her phone rings as often as a 911 emergency call center. She and her friends rescued over 1,100 abandoned animals in Puerto Rico last year, mostly dogs. NEW YORK — Leopoldina Roubian feels like her phone rings as often as a 911 emergency call center. She and her friends rescued over 1,100 abandoned animals in Puerto Rico last year, mostly dogs. People leave animals in boxes on her doorstep. They call her when they see stray dogs, who are all over — on beaches, in parks and by the roadside. And then there are the puppies left to die in vacant houses or dumpsters. Many animal lovers have heard of Puerto Rico’s “dead dog beach,” a stretch of sand and jungle on the island’s southeastern side where people dump their dogs. But the truth is Puerto Rico has become “dead dog island,” Roubian says. The problem is getting worse as Puerto Rico’s economic crisis deepens. Roubian never leaves home without pet food because she finds strays daily. Her property has become a makeshift shelter. She lives with over 20 dogs and sometimes pigs, cats and horses too. No one knows exactly how many strays Puerto Rico has, but a 2010 documentary about the plight is called “100,000” for a reason. “If people care, they dump the dog in areas like Rincon [a popular surfing town] where people and tourists are around,” says Roubian. But many don’t care — or don’t have the money to care. They leave dogs by the road or in the trash. People are literally fleeing Puerto Rico because the island’s economy is so bad. One in 10 people is out of work. 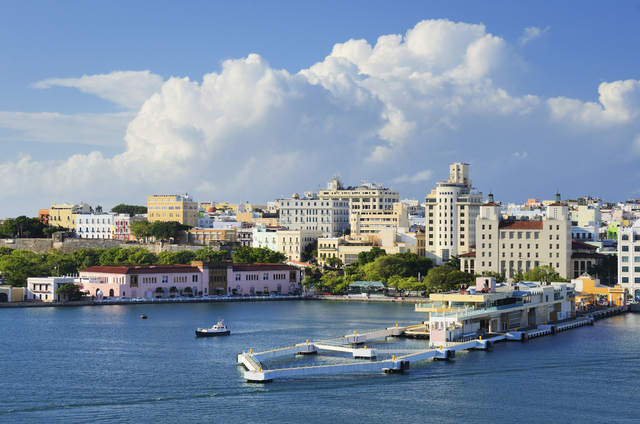 The island’s government has run out of money and is $72 billion in debt. Over 10 percent of the population has booked a one-way ticket out (mostly to Florida, Texas and elsewhere in the mainland U.S.) in the past decade. Sometimes people just leave their homes and lock their dogs inside, never to return. Volunteers say the island’s no-kill shelters are full and that animals taken to many facilities are put down. That’s why nonprofits such as Barks of Hope (which Roubian spearheads) and her partners ARF (Animal Rescue Foundation) and Defensa Animal de Rincón try so hard to rescue animals first. Roubian is a fairy godmother to Puerto Rican animals. But she has tough love for humans who don’t care for their pets. “Your dog is beautiful. Why does it have balls?” she frequently asks people on the streets. Part of the reason the dog crisis is so bad is that Puerto Ricans don’t spay or neuter their dogs. It’s a machismo thing. Puerto Rican men don’t want to cut off a dog’s manhood. The trouble is when dogs get abandoned on the streets, they breed and breed and breed. The government is also at fault, volunteers say. Veterinarians are willing to come help — for free. They offer to treat and neuter strays, but technically, they are forbidden from operating under Puerto Rican law. The vets would need a license issued by a Puerto Rican board. The process is cumbersome and there are no longer any veterinary schools on the island. “Maybe they think it would take business away from Puerto Rican doctors, but these animals aren’t going to any vets at all,” says Denise Gilbert, who moved to Rincon, Puerto Rico with her family several years ago. She has adopted 12 dogs and 15 cats. A simple stroke of a pen by the Puerto Rican government to accept veterinary licenses from other U.S. states or grant temporary permits to visiting doctors could make a big difference, Gilbert says. Former governors — both liberal and conservative — told CNNMoney they were aware of the problem but it fell to the bottom of the “to do” list. The current government has made some efforts to partner with the Humane Society, but the problem is vast. As word has spread about Puerto Rico’s stray dogs — including many pure bred Shih Tzu and Maltese — people in New York, New Jersey and elsewhere have started to step up and adopt the animals. Or just get the animals to no-kill shelters. Volunteers like Roubian and Gilbert often wake up at 3 a.m. to drive dogs to the San Juan airport on the other side of the island so they can board morning flights to New York. American Airlines flies dogs under 50 pounds to New York and other locations for about $50 to $80, a dramatically reduced rate. Many American Airlines workers have embraced the cause. They clean the kennels the dogs are transported in and return them to the Puerto Rican volunteers so they can be used again. Volunteers wish other airlines like United and JetBlue that fly those routes would offer discounts as well. United and JetBlue didn’t respond to CNNMoney’s request for comment for this article. Roubian’s average veterinary bill is around $5,000 a month. She never turns away animals, but she dreams of the day when this crisis ends and she gets happy phone calls again. “I don’t know what it is about Puerto Rican dogs, but they are the best,” Roubian says as her latest adopted pup, a Chihuahua, licks her face.